Today is the 3rd anniversary of Project 333. I’ve been dressing with less for three years and it all started with a crazy experiment. It turns out that this crazy experiment that some have labeled “too extreme” is not that extreme at all. 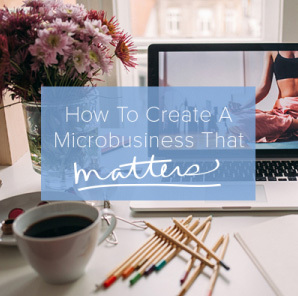 It’s become a change in lifestyle, an important part of my microbusiness, and a powerful way to connect with really great people like you. People care more about what they are wearing than what I am wearing. Fewer decisions in the closet allow for more clarity for more important choices. Just because a shirt looks good on me doesn’t mean I need it in every color. I can pack my entire wardrobe in a carry on bag. I used to spend too much money on clothing I didn’t wear very much. Comparison makes me feel like I’m not good enough. Advertising makes me feel like I don’t have enough. When clothing fits my body, I look and feel better. If something wears out, I can replace it. I can get ready for anything in less than 10 minutes. It’s ok to invest in quality clothing. A supportive community makes the most challenging things easier and enjoyable. Someone needs the clothing I don’t wear. One is enough in almost every situation. Mornings are so much easier dressing with less. With less clothing, I have more time and money. Almost anything is more fun than shopping. I never have to worry about closet space. 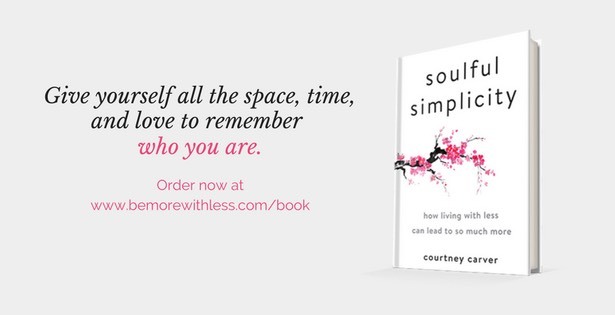 Simplicity inspires interesting conversations and beautiful friendships. People stop buying you clothing and accessories when you create a minimalist fashion project. Dry clean only items aren’t functional in a small wardrobe. I used to spend too much time figuring out what to wear. Men like this project too. 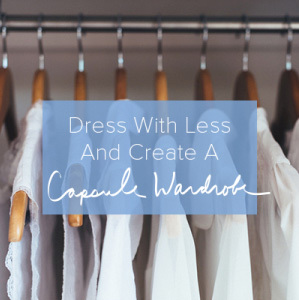 Dressing with less has inspired me to live with less. Now that I don’t think about what to where, I am more creative. I can appreciate fashion without owning it. Counting your clothes has nothing to do with numbers. If I wait 30 days to buy something, I almost always forget about it. Dressing with less works around the world. This crazy experiment has become a life changing project. Congratulations, Courtney! I’ve gained so much by owning less clothing. Thanks for all your help!!! Dressing with less has help me refine MY style. Dressing with less has taught me that one item can be worn in different ways. Dressing with less taught me that having black/gray and jeans for bottoms allow for many outfits. 1) Fabric matters — pay attention! 2) Dress for the life you have. 3) Comfort trumps style (but both together are great!). 4) Know what colors flatter you. 5) Know what flatters your shape. 6) With a small closet, everything has to earn it’s place. If it’s not carrying it’s weight, let it go. 7) It’s OK to wear the same dress 5 Sundays in a row, or the same skirt twice in a week, especially if you feel fabulous in it. 8) 1 piece you feel fabulous in is worth 3 that you feel OK in. 9) Writing down what you wear and your thoughts on it helps clarify your feelings and whether you should keep something. 10) It’s OK to spend a lot on one piece you will wear a whole bunch. It doesn’t make as much sense to spend a lot on special occasion clothes. LOVED this post. I am far from 33 but recently got rid of 100 items in my closet. It is very much just the beginning of a new mindset for my wardrobe. I’d love that Molly. Thank you! A few months ago I came to the same realization that you have about the colors I wear. Way back in the ’80’s (I’m 62) it was all the rage to have your “colors done”. I learned that I was a “fall”, that all of my best colors are fall colors – browns, rusts, oranges, but also some greens and blues (but never black for me – too harsh). Over the years, I got away from my colors and ended up with every color under the sun (even lots of black, because it seemed sensible and goes with so much) and way too many clothes. I recently returned to my core colors, and I decided that it is OK if I stick to only a few colors that I LOVE and feel great in every time I wear it. I decided that it is OK to have LOTS of turquoise (my fav). And I got rid of all things black and I love my wardrobe more than I have in years. If you live in a cold climate, are you allowed 33 for hot and cold temperature changes? I did Project 333 for the first time this summer. I have gutted my wardrobe 3 times now. I still own more than 33 items but I am pretty minimalist by most standards and I love it. I know what I like, what I feel comfortable in and what suits me. Today I am 50 and I feel completely happy in my skin and in my clothes. Letting go of an immense amount of stuff I didn’t need (not just clothes) has not only made me feel freer and more in control but has completely revised the way I shop (or rather don’t shop). Great post, Courtney! I only did Project 333 once (April – June), but I learned a lot and have taken those lessons forward with me. In July, I wrote about “My Top 8 Lessons from Project 333” (http://recoveringshopaholic.com/top-8-lessons-from-project-333/) and I’m still learning and growing. I still have a wardrobe that’s too large and I still shop too much, but I feel that doing Project 333 really helped to accelerate my recovery. I am strongly considering doing Project 333 again, this time without posting all of my outfit photos (which was quite nerve-wracking and I felt pressure to make my outfits more exciting). Perhaps I need a “booster shot” to really get in my bones that I don’t need a large wardrobe! Thanks so much for creating Project 333 and for pushing me to do it, Courtney! I’m really glad I did and I’m surprising even myself in considering giving it another go! Perhaps dressing with less can actually become a way of life for me like it is for so many other people. I like #30! If I wait 30 days….. If I wait even one day after seeing something I think I’d like to have, I forget about it and never look back. 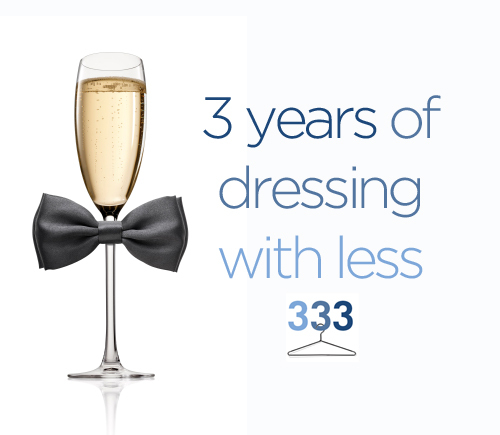 But Project 333 is a little difficult for me – I don’t have 33 items in my wardrobe – just lucky I guess! I came over ’cause Gillie talks about this project, and I enjoy her blog very much! Wonderful, I may be a frugal fashionista, but it’s because I like to save more than I like to shop – congrats! Thanks for this post Courtney! I’ve been on an ongoing journey to simplify my wardrobe – the hardest part for me has been changing my thoughts of shopping as reward and replacing that with something else – e.g. exercise, cooking a healthy meal, catching up with a friend over coffee. I look forward to your new posts for motivation and inspiration! Living in Florida, I don’t have many big changes in the seasons. I find that about 20 items are in my wardrobe year round. My “uniform” consists of either black slacks or jeans and a pretty top. I only have a few light weight cardigans that I wear over tank tops. I have a few pairs of pumps to dress it up and a few pairs of flats for every day. One thing I totally agree on: It is SO much easier to get dressed in the morning! Also, I have no problem repeating items. Now that I have gotten rid of the clothes that just hung in my closet, I really love what is left! I am currently going through my handbags. I have about 4 that I need to take to the consignment shop. I tend wear the same two bags. I have thoroughly enjoyed this process. It is freeing! I have been retired for years. When I worked in an office I wore 3 pairs of slacks with 6 tops and 3 cardigans. Now I mostly wear 2 pairs of jeans and 5 t shirts except in the winter (it’s Chicago) when I add 4 sweatshirts. I have 1 black dress. I love jewelry and buy most of it at rummage sales and garage sales. I am thinking of getting rid of a few items I never wear, a black skirt and a dressy jacket. The best thing about fake pearl earrings and a necklace is they dress up any outfit. If I wear silver and turquoise jewelry, it’s something different. Jewelry takes up very little space and I really enjoy it.